The German language is resourceful at describing complex concepts in a single word. One such word evokes the investor emotion that dampened stocks today: Weltschmerz, literally “world pain,” a feeling that the world is on your shoulders. Now that first-quarter earnings season is winding down, global concerns are coming to the fore. The main stock indices drifted lower today, as investors worried anew about trade and international tensions. The Dow Jones Industrial Average closed essentially flat, while the S&P 500 and Nasdaq both ended in the red. Talks between China and the U.S. aren’t going well. Neither are re-negotiations over the North American Free Trade Agreement (NAFTA). Italy is making noises about reneging on its massive debt. Violent conflict is flaring in the Middle East, after the Trump administration outraged the Palestinians by moving the American embassy to Jerusalem. North Korea remains a loose cannon, with next month’s summit in doubt. The price of West Texas Intermediate (WTI) fell by 0.25% today to close at $71.31 per barrel. Brent North Sea crude, on which international oils is based, fell 0.92% to close at $78.57/bbl. Crude’s fall is likely attributable to traders taking profits off the table. But here’s a trend that’s not getting enough attention: The upside momentum of the energy sector has limited the downsides in most equity indices. On Thursday, Brent breached the psychologically important level of $80/bbl. Over the past 12 months, both benchmarks have embarked on a steady rise (see chart). This year, if you’re seeking clues as to the direction of the stock market, look to the energy sector. Oil prices and stocks have tended to move in tandem. As oil prices keep climbing, investors interpret the upward momentum as a positive sign of economic expansion. OPEC’s production cuts have actually stuck this time around, with little of the usual cheating. The House of Saud and Vladimir Putin’s petro-state of Russia are even cooperating, which is no small feat. Oil prices also have been rallying because President Trump recently yanked the U.S. out of the Iran nuclear deal and vowed to reimpose tough sanctions on the major oil producer. At the same time, Venezuelan production is plummeting as that ill-starred socialist state devolves into chaos. 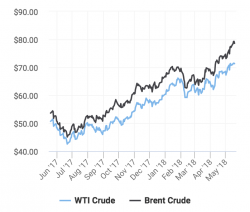 You’d think that rising crude prices would spark a tsunami of new shale oil from the fertile fields of North America, such as the Bakken Formation and Permian Basin. But think again. Both the Bakken and Permian are booming, but not to a degree that could spawn another destabilizing oil glut. Located in the Upper Midwest and Canada, the Bakken was among the first U.S. shale basins in which drillers started to pump oil by the use of hydraulic fracturing, aka “fracking.” The Bakken ranks as one of the largest oil developments in the U.S. during the past 40 years. The Permian Basin of west Texas and southeast New Mexico also represents one of the most prolific oil producing regions in the U.S.
WTI is considered light or “sweet,” which means low-sulfur. Brent contains greater amounts of sulfur. Shale oil is generally designated as “super sweet,” with even less sulfur than the intermediate level WTI. Domestic fracking producers are cranking out more crude oil than refineries can handle. Most of these refineries were built decades ago, before the fracking revolution, and they’re designed to handle heavier crude. Consequently, America’s refiners, ports and pipelines are contending with crude bottlenecks. Why not build new refineries, you ask? Well, for one, they’re extremely expensive. And even in the anti-regulation Trump era, environmental restrictions combined with the forces of NIMBY (not-in-my-backyard) make refinery approvals a costly and protracted process. Existing refineries have made technological adjustments that allow them to process shale oil, but that’s still not enough to pick up the slack. The need to reward shareholders also keeps oil production in check, because it compels energy producers to limit capital spending and focus on high-return projects. Of course, as oil prices keep rising, “animal spirits” in the energy patch will inevitably lead to excess production and the boom-bust cycle will repeat itself. The industry will eventually find ways to mitigate bottlenecks. But for now, energy supply-and-demand has found its “sweet spot,” thanks to the necessities of super sweet crude. Looking forward, that’s a tailwind for the broader market that should counterbalance the sort of world pain that investors felt today.